What would you do if you were brave enough? This morning I woke at 4am, I had that massive rush of adrenalin, call it excitement, perhaps anxiety, anticipation, fear… when you are building your own business the patter of your heart can sometimes be hard to read. I always ask myself what is the emotion I a m feeling, how do I work with it? This sentiment will immediately resonate with anyone else who has a dream and is excited about it. The daily drive to work towards a vision you hold. 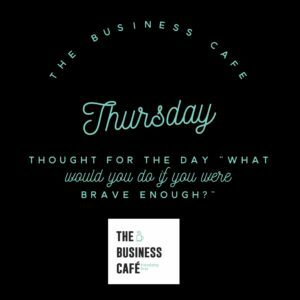 As I worked through this thought, I found myself repeating these words “what would I do if I was brave enough?”. I could answer that question instantly, I then asked myself, “am I brave enough?”. I have always loved the words of Marianne Williamson in her stunning poem “Our deepest Fear”. I heard them when I was building my first business, Ecademy, when I was out of my depth and was terrified that I was not good enough to achieve the dreams I had and the expectations others held of me. Each time I read it, I read a new set of thoughts that inspire me. All of the TBC Friends, yes you, reading this now, must have a HUGE dream. One thing I know, you are brave enough, being self employed or running a small business makes you the bravest people in the economy. There is nothing easy about this choice you made. So, have you ever spoken your BIG dream out loud, told someone else what it is, written it down, even allowed yourself to think it? A private thought, your own desires that drives you and pumps your heart and stops you from giving up when the walls feel like they are closing in around you.